Even if coin collecting might just be a hobby of yours, thinking about investing in your collection will turn out to be a solid plan for the future. Whether you wish to pass it down later on or not, investing in something that you’re dedicated to and enjoy doing is always a pleasurable way to profit from. So, look at your hobby as something that will rise in value even more one day and become a great way to invest in your future. Due to their value, 50-cent Canadian coins are sought-after the most; in fact, the rarer they are – the better. In general, it pays off to educate yourself about the special and valuable coins that are always great additions to any collection. Read on to learn how a coin collecting hobby can become a very valuable investment. Colonial Acres can help you grow your collection. In order to be able to search for the right coins, you need to know all about the valuable collectibles. In order to do so, try to find a guide to help you or consult experienced collectors. You can also subscribe to monthly magazines that let you know about all the interesting events and unique pieces for dedicated numismatists. Once you learn about the interesting history of Canadian silver coins you’ll know what to search for and which ones are worth paying a bit more for. If you’re trying to get a couple of missing pieces to complete your collection, you should definitely check out Colonial Acres and their frequent sales and auctions. You might stumble upon the exact coin that you’re missing on sale! Even if you’re just starting out with coin collecting, once you educate yourself on valuable coins, you’ll be able to find an assortment of more affordable pieces. On the other hand, If you’re more advanced, you can try to find the more challenging and rare coins. Owning a valuable collection means you’ll have to take care of it properly to prevent damage. Storing coins in boxes or albums of high quality is what you should be aiming for since cheaper options can damage your coins in different ways. Once you’ve taken care of the storage, you should think about the right person to leave your collection to. If you don’t have any coin collectors in the family, try gifting them coins for holidays or special occasions just to get them interested in the whole sphere of numismatics. Then, if anyone, in particular, shows interest in learning more or collecting, you’ll know where your own collection can go to. Many parents who collect coins are actually doing so because they want to invest in their children’s future as well. If you’re into the hobby of collecting coins and want to give the whole experience even more excitement by investing in your collection, Colonial Acres is a great place to shop for coins. You can find all sorts of Canadian coins with 50 cent value or other sorts of rare and special offers. They have frequent auctions and sales where you’ll be able to find great deals and additions to your collection. In case of any questions, the staff at Colonial Acres will be happy to help you and give you advice based on your coins. 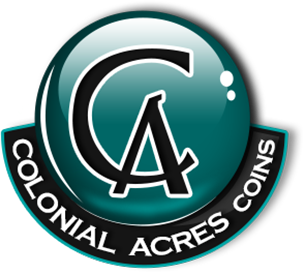 So, if you happen to miss certain coins to complete your collection, Colonial Acres should be your first choice to shop at.